Recently I went back and revisited Carola Dunn‘s Daisy Dalrymple Mystery Series, and it got me thinking about the historical/period themed mysteries that are home to many Cozy Mysteries. I’ve already got a series of posts on these as a whole >>> but I’ve also been thinking lately how different the setting can make a series seem and how it might be nice to be able to help find similar novels based in this time period. To help make that easier I’ve decided to begin making more focused themes for the site so people can find similar novels by setting more easily. This time we’ll be starting with the 1920s! A period often called the “Roaring Twenties” in the United States, the 1920s are often characterized by wild times, prohibition, and flappers, but it was also a time for social change>>> women’s liberation made significant progress in particular, with women getting the right to vote in both the United States and Great Britain during the 1920s. I’ve included some examples below – but if you’ve got any other examples of Cozy Mystery authors who have a series set in the 1920s, please be sure to send in a comment so I can include them in the list! Suzanne Arruda: Jade del Cameron Mystery Series – Jade is an adventurer in Africa. George Baxt: Celebrity Sleuths Mystery Series – Not all of the books in this series take place during the 1920s, however several of them do. K.K. 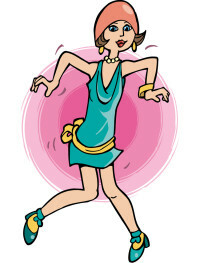 Beck: The Iris Cooper & Jack Clancy Mystery Series is set during the late 1920s, so of course, it features a flapper. Simon Brett: Blotto and Twinks Mystery Series – The sleuths in this series are a British brother and sister team. Frances Brody: Kate Shackleton Mystery Series – Kate is a WWI widow in a British small milling village during the 1920s. Maia Chance: Discreet Retrieval Agency Mystery Series – Lola Woodby is a 1920s society matron and widow. Jill Churchill: Grace and Favor Mystery Series – Brother/sister sleuthing duo Lily and Robert Brewster start sleuthing after they lose all of their money in upstate New York. Ellen Collier: Jazz Age Mystery Series – Jazz Cross is a society reporter. Jeanne M. Dams: The Hilda Johansson Mystery Series takes place in the USA, during the early 1920s. Hilda is a Swedish immigrant housemaid in South Bend, Indiana. Alice Duncan: Daisy Gumm Majesty Mystery Series – Daisy is a séance and tarot psychic in California. Alice Duncan: Mercy Alcutt Mystery Series – Mercy is the owner of a rooming house in Hollywood. Carola Dunn: The Daisy Dalrymple Mystery Series is set in 1920s England. Daisy is a journalist who does more than report the stories… she solves them! R. Austin Freeman: Dr. Thorndyke Mysteries – Freeman is the creator of inverted detective stories in which you find out the crime and possibly the culprit at the beginning, and then read about the how the detective solved the crime. Dolores Gordon-Smith: Jack Haldean Mystery Series – Jack was a Royal Flying Corps pilot and is currently a young crime writer in England. Melanie Jackson: Jane Blackthorn Mystery Series – Jane is a young widow/sleuth. Catriona McPherson: The Dandy Gilver Mystery Series has, as its sleuth, Dandy (Dandelion Dahlia Leston), a Scottish aristocrat in the 1920. Mary Miley writes the Roaring Twenties Mystery Series which features an ex-Vaudeville/silent films actress in Hollywood during the 1920s. J. J. Murphy: The Algonquin Round Table Mystery Series takes place in New York during the 1920s, and features author Dorothy Parker as its sleuth. Agata Stanford: Dorothy Parker Mystery Series – The sleuth in this series is non other than the famous real life author, Dorothy Parker. Charles Todd: Ian Rutledge Mystery Series – Rutledge is a WW I veteran and Scotland Yard detective in England. Jacqueline Winspear: Maisie Dobbs Mystery Series – Maisy is a psychologist/sleuth in London. If you’re interested in seeing lots and lots of other Cozy Mystery themes (and by “lots” I truly mean lots! ), be sure to visit the Cozy Mysteries by Themes page on my site. Jill Churchill’s Grace and Favor mysteries begin with the crash of 1929. Brother and sister, Lily and Robert Brewster inherit a house in a small upstate NY town after losing all their money in the crash. Fun sleuths. Charles Todd’s Ian Rutledge is a post WWI series (late teens-early 20’s) with a Scotland Yard detective suffering from shell shock while trying to restart his police career. Melody Jackson’s Jane Blackthorn is a young widow in 1921 who stumbles over mysteries on a regular basis. John Reisinger writes fictional accounts based on real cases from the 20’s in his Max Hurlock mysteries. Ellen Collier’s Jazz Age Mysteries about society reporter Jazz Cross. I LOVED Jill Churchill’s Grace and Favor series! I wish it had run longer!!!! Karen, thank you for these authors. I’ll go add them to the Historical list. try the “Jack Haldane” mysteries by Dolores Gordon-Smith they are taking UK by storm and are set in the twentiesl; see Amazon,. Hi again. Where would we be without recommendations from fellow mystery readers and fans? Thanks Anton for the heads-up about the Jack Haldane series. Loved what I have read so far about the author and the series. I’ve just ordered the first two books….cannot wait! Anton, thanks for the recommendation. I’ve just added her to the list. ‘Golden Age’ mystery author R. Austin Freeman was in his heyday in the 1920’s. For those unfamiliar with his works, his ‘Dr Thorndyke’ was a more long-winded version of Sherlock Holmes, with a lot more (for the day) technical science included. Has anyone read the Agata Stanford “Dorothy Parker Mystery Series”? Found reference to it by accident, but looks interesting. Cheryl, I haven’t, but it looks like her Dorothy Parker Mystery Series should be on this list. Thank you! Hi. Thank you thank you. I’d forgotten about the Jill Churchill Grace and Favour series. Off to reread them. (I wish there had been more, the series “ended” a bit strangely.) I’d heard there was at least one more that didn’t get published, for some reason. Do your readers have any ideas? Laurie R. King. also has two standalone novels that would meet these criteria of the roaring 20’s. The books have a couple of characters in common. The one that I can remember off the top of my head is The Bones of Paris. Very enjoyable. Oh, and thanks for the reminder about J.J. Murphy and the Algonquin Round Table series. Upon checking your list, I hadn’t heard about the books beyond number two. I’m off to my bookseller to hunt them down. Danna, what would we ever do without you keeping track of all these great books. You must get totally exhausted. Mary G, thank you. I just added Laurie R. King’s Harris Stuyvesant Mystery Series to the list. I think the Dalrymple ones are the only cozies I’ve read. I’ll make a note of the others. Thanks. Possibly it’s because I don’t have kids, myself, and can’t relate to Jane the same way. I don’t know, but I do know I love the other series! Susan*, hmmm… just what I need! Another series to follow! I may just have to try Anything Goes. Oh, and one piece of trivia regards the series, too. Whereas the Jane Jeffry mysteries are all titled after movies, the Grace and Favour mysteries all have 1920’s / 30’s song titles! Don’t forget Rhys Bowen’s wonderful “Her Royal Spyness” series; they occur in the thirties. Barbara Cleverly’s Joe Sandilands series and Ashley Weaver’s Amory Ames series are also set in ’30s UK and are also fun, and very well done. I just read Don’t Die Under the Apple Tree a Rosie the Riveter mystery. It is set in the 20’s when women started working for the war. The main character Rosie is a strong, resourceful sleuth. On the other hand, I wasn’t aware of this series, just checked it out, it has strong reviews for both the series and the author, so I’m going to hunt it down. I like historical mysteries too. Mary g, thank you. They do look good, don’t they?